Post-secondary education is expensive. As tuition is steadily on the rise, educators are looking for creative ways to reduce costs for their students. One way they’re doing this is by creating low-cost, or free, alternatives to the traditional textbook. This can manifest in a variety of ways—eBooks, PDFs or, in this case, interactive online lessons. In this interview, you’ll hear from Cathy Bill, Assistant Professor at Columbus State Community College. Cathy will share how she and the BIO 2301 digitization group began creating high quality digital materials for their Anatomy and Physiology courses as an alternative to traditional textbooks. SoftChalk: You’ve been teaching for over 20 years. When did you begin to realize that an alternative was needed for the traditional textbook? Cathy: This has been on our mind for at least 6 years. SoftChalk: Was that realization based on reducing student costs or was it to have more control over the content? Or both? Cathy: It was both reducing cost and having control over the content. Related to the costs, the price of traditional textbooks seems to have skyrocketed in the past few years. As a community college, we have many students who can’t afford these texts. In some cases, the cost of the textbook is higher than our tuition and fees. When a textbook approximates the cost of a class, this can negatively influence student success in that self-paying students are forced to decide between purchasing a textbook or taking another class. Our Textbook Affordability and Accessibility Committee recently surveyed students and found this to be a common concern—students report having to take fewer classes per semester, as they can’t afford to purchase all the required texts. Also, students have been forced to choose between using their limited resources for living expenses or course materials. When course materials are inaccessible to students, they are at a disadvantage in the course. In addition to cost savings, we love the idea of having control over the content. In our upper level courses, we have separate Human Anatomy and Human Physiology courses. To reduce costs, we are using a combined Anatomy and Physiology textbook for these two courses, so that one textbook is required for 2 classes. However, this necessitates jumping around in the textbook, which students find difficult. With the development of our own interactive digital materials, we have been able to provide a more streamlined experience for our students. We have also chosen to include text in a conversational tone, especially when there are difficult concepts to present. Those concepts are presented in the traditional manner, but also in a more informal format, somewhat like what we would do in class, to make it more approachable and understandable. SoftChalk: Once you decided that this was a high priority need for your students, how did you get started? Cathy: Thankfully, we had full support of our administration in this initiative. We also have a Distance Education and Instructional Support (DEIS) department, with many talented instructional designers, serving both as developers of digital content and project managers with our team. We also have a medical illustrator on staff with DEIS. We began working collaboratively to write text and create digital assets and assessments for our anatomy and physiology courses. We started with our lower level course, Fundamentals of Anatomy and Physiology, a lecture only course. Our colleagues in Health Information Management Technology were working on developing highly interactive online materials for all their courses and our Fundamentals course is required for students in that area. We had a group of 6 faculty members committed to this work. We were provided Macbooks and iPads and trained by Apple experts. We learned to use iBooks author and other apps to create interactive materials. Additionally, we wrote and recorded scripts for digital assets to be animated by our DEIS staff. This 2-year effort resulted in the production of 6 separate iBooks, a total of 3 GB of material containing 428 pages of text and interactive material including 56 animations, 19 interactive animated assessments, over 500 images, over 200 questions, over 1200 glossary terms and almost 100 recorded keynotes (similar to short lecture PowerPoint presentations). These contain all the material we cover in Fundamentals of Human Anatomy and Physiology. Last year, we completed digitizing half of our Human Physiology course. This iBook currently has 250 pages with 39 interactive animations, 24 interactive animated assessments, over 200 images and tables and 21 recorded keynotes. The second half of this course is being digitized this year. 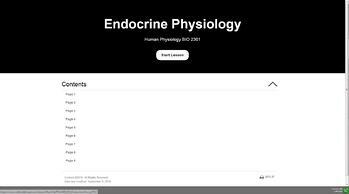 SoftChalk: You mentioned that initially you created materials for your Human Physiology course in iBooks but ran into some challenges. Can you elaborate? Cathy: The iBooks are great in that they are highly interactive and streamlined, with all items in one place, in a linear format. Additionally, once downloaded, an internet connection is not needed. However, an Apple device is required. A little more than 50% of our student population has an Apple device. Therefore, about half of our students would not be able to access the material, unless they used campus computers. Also, all the material is housed outside of our learning management system, Blackboard, and so the assessments in the iBooks could only be used as formative assessments. We have the summative assessments in Blackboard. The challenge with this is that students may complete the quizzes and exams without using the materials in the iBook, similar to students who don’t read the text. In the traditional sections of our classes, we have designed collaborative and active learning opportunities that require the students to use the iBooks. However, for the students who take this class fully online, it is more difficult to assess their interaction with the material. SoftChalk: How did you eventually address these challenges? Cathy: We actually have 3 initiatives to address these challenges. We have Apple designated courses on our course schedule. These “Bring Your Own Apple Device (BYOAD)” sections offer the iBooks at no cost to students, saving them $116 in textbook costs. We also offer students enrolled in our traditional sections the option of using the iBook rather than the textbook. Finally, we began creating SoftChalk lessons for our Human Physiology course. We have been using SoftChalk in our Fundamentals course as well as in our Anatomy and Physiology 1 and 2 courses, and in our Human Physiology course since 2012. This new initiative with SoftChalk is different in that we are including the interactive animations and other digital assets and images that were created for the iBook project. We also include short lecture presentations and multiple assessments in each SoftChalk lesson. I really like the fact that any lessons housed in SoftChalk Cloud are easily modified and those modifications automatically show up in every class that uses that lesson. I have had students find questions that were mis-keyed and that can quickly be corrected! Also, we use the link to the lessons which integrates into our learning management system’s grade center, which allows for unity between presentation of the material and assessments. While this does require an Internet connection, we have not received any student complaints thus far. SoftChalk: Since implementing the Human Physiology course in SoftChalk, what has the response been from the students? The faculty? Cathy: We are primarily using these lessons in our blended sections of Human Physiology. In the blended sections, students must learn the lecture material on their own using provided resources. In the past, we provided lecture videos, lecture notes, and PowerPoint presentations, with short SoftChalk lessons (ungraded). Many students resorted to “memorizing the notes” and did not utilize the other resources, which is obviously not conducive to learning this difficult material. This semester, with the SoftChalk lessons linked into the Grade Center of our learning management system, students are accessing all the interactive materials and have commented that it is very helpful. We also placed the assets in SoftChalk Cloud, under “Files”, including lecture videos, so the issues we had in the past with certain browsers blocking those are no longer causing problems. We have also had fewer questions on the material, and exam grades are good thus far. It seems to be an effective way to deliver interactive course material. Faculty also have responded positively to the SoftChalk lessons, impressed with the content, interactive quizzing ability and ease of use. One has commented “these lessons are excellent teaching tools and enjoyable—my students adore them and have great fun with them”. As a group of 5 faculty members have worked on digitizing our Human Physiology course and are using these lessons in their blended sections. Each of us will customize the text and assessments, to accommodate our own teaching styles. This will easily be accomplished as SoftChalk is user friendly. SoftChalk: How has the transition to digital course materials impacted student costs? Cathy: As mentioned earlier, students in the Fundamentals of Human Anatomy and Physiology are saving $116 in course materials costs. For the Human Physiology course, the cost savings is $180.75. Since that text is also used in our Human Anatomy course, some students have already purchased the text and so are not sharing in the savings. However, we have many students who told us they did not buy the text for Anatomy and so are experiencing the cost savings. We have approximately 550 students taking this course each semester. SoftChalk: How has it impacted the course/program? Cathy: Part of the value it brings to students in Human Physiology is the ability to self-assess as they progress through a very complex curriculum. SoftChalk enables us to integrate written and video resources into one condensed place. It streamlines the learning process and is particularly helpful for distance learning students. We are still early in the adoption of these resources, but it appears that success, as measured by our summative assessments, is higher in the Human Physiology courses using these digitized lessons. As for Fundamentals of Anatomy and Physiology, which is now in the third semester of using the iBooks, final grades are equal to or higher than what we have seen when using a traditional text. Therefore, we are seeing success at a lower cost to students, with highly interactive materials which they have access to indefinitely. Seems like a win-win to us! Student survey responses in that course indicate high satisfaction with these highly interactive, very portable materials. A large percentage (>85%) of students preferred the iBook to a traditional textbook. SoftChalk: What are your plans moving forward? What’s next? Cathy: We have 2 other courses under the umbrella of Anatomy and Physiology in our department: Anatomy and Physiology I and II. Plans are to also digitize these courses, using assets already created for our Fundamentals and Human Physiology courses. Once this is complete, we will have a total of 5 courses, serving over 1,600 students per semester. This could potentially result in a cumulative savings of approximately $180,000 per semester in textbook costs. SoftChalk: Finally, for other educators or institutions looking to make the transition to online course materials, and away from traditional textbooks, what is your advice for getting started? When creating course content, the goal should be to present material in small chunks, in a well-organized manner. Follow each small section with a formative assessment, so students can judge their understanding before moving on. This is especially important in our content heavy area of Anatomy and Physiology. This is a “digital storytelling” initiative, and we know that one of the most influential factors in student learning is what they are thinking about when they are interacting with the material. If we can get them thinking about the subject, by drawing them in with an anecdote, story or video introducing the topic, they are more likely to learn the material presented. For maximum impact, I would say work with all full time faculty teaching that course. It has been great working as a team, as we can each work to our strengths and also explain difficult topics in several different ways. It can also get tedious and discouraging, and having a team helps as we all keep each other going. This also increases the likelihood of adoption of these materials in all sections of the course, for maximal savings to students. Be prepared for a lot of work. While SoftChalk and iBooks author are both relatively easy to learn and to use, it still takes a lot of time to write text, review, revise, write questions, choose images, record videos, write storyboards, review finished animations, etc. But the finished product is worth it! While this has been an extremely time consuming effort, it has been enjoyable and rewarding to see the student’s use and response. When I can just breeze through the lab exercise on Cardiac Cycle, because the students already understand the material, it makes all the effort worthwhile! Take advantage of learning opportunities on the platform you will use. I know SoftChalk has webinars and short videos explaining almost every aspect of their platform. We had in-house seminars and workshops, where other faculty presented their best practices and tips. If those are available to you, take full advantage of them. It is much easier to learn from someone who has already experienced the hiccups and problems inherent to any program and has hints for dealing with those. As for getting started, I would say “just jump in”. Once you have counted the cost, especially the time commitment, and believe you are ready to do this, just do it. Start small, with a short lesson, a few questions and other assessments and put it out there. See the student response. Share with colleagues, get feedback—most will be impressed! Cathy Bill, MS, DVM is an Assistant Professor of human anatomy and physiology and lead faculty of physiology courses at Columbus State Community College. She has been an educator for 27 years. In addition to serving as a co-author on two iBooks for Anatomy and Physiology, she is a coauthor on a series of custom course manuals in Anatomy & Physiology. She is a 2005 recipient of Columbus State’s Distinguished Teaching Award. Merideth Sellars, MS is an Associate Professor in the Department of Biological and Physical Sciences at Columbus State Community College where she serves as the PI for the Future Scientists of Ohio Scholars Program, Faculty Advisor for STEM Club and a coordinator for STEM Community Outreach and Engagement. In addition to serving as a co-author on two iBooks in Anatomy and Physiology, Merideth serves as the Distance Learning Lead Instructor for her department. She is a 2011 recipient of Columbus State's Distinguished Teaching Award. Julie Posey, MS is an Assistant Professor of human anatomy and physiology and lead faculty of general biology disciplines at Columbus State Community College. She has been an educator for 22 years and holds a Masters degree in pharmacology. In addition to serving as a co-author on two iBooks for Anatomy and Physiology, she is a coauthor on a series of custom course manuals in A&P and Human Biology. She is a 2013 recipient of Columbus State’s Distinguished Teaching Award. Ola Ali, MD, MS, MPH, PhD is an Annually Contracted Faculty member at Columbus State Community College, currently teaching Human Anatomy and Human Physiology courses. After graduating from the medical school, she earned a masters of gynecology, studied and obtained the United Stated Medical License Exams, completed a masters in Clinical and transitional sciences and finally a PhD in Epidemiology. She has been an educator for 7 years and was a 2017 nominee for Columbus State’s Distinguished Teaching Award. Sharon Rohr Barnewall, MS, DVM is a Professor of human anatomy and physiology at Columbus State Community College. She has been an educator for 25 years. In addition to serving as a co-author on two iBooks for Anatomy and Physiology, she is a coauthor on a series of custom course manuals in Anatomy & Physiology. She is a 2018 recipient of Columbus State’s Distinguished Full Professor Award.